Preheat your oven to 425 degrees. Take 2 baking sheets and line them with aluminum foil, spraying the foil with nonstick cooking spray afterwards. Divide the chicken wings between the two lined sheets, sprinkling the kosher salt and black pepper onto the wings afterwards. Place one baking sheet on the middle rack and the other on the bottom rack. Cook for 30 minutes, then switch places with the baking sheets and continue cooking for another 30 minutes. Near the end of the last 30 minutes on the cook time for the chicken wings, take a saucepan out and pour the hot sauce in, turning the heat up high enough for boiling to occur. Once the hot sauce is boiling, take the saucepan off the heat and stir one piece of butter in at a time, not adding more butter until the previous piece has melted. Stir in the molasses and cayenne until combined. Place the cooked chicken wings in a large mixing bowl, pouring the sauce over them afterwards. Toss the chicken wings to coat and eat immediately afterwards. These wings were freaking delicious ! I thought that the molasses would create a sweet and spicy flavor but you don’t get any sweetness in the flavor. 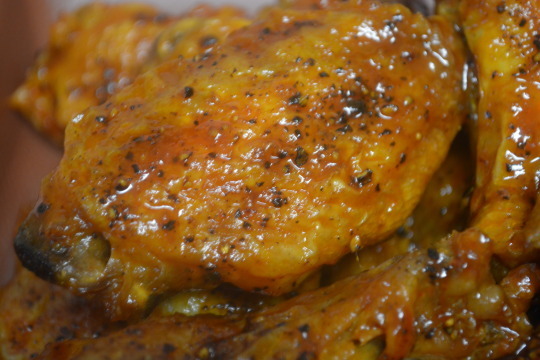 What sauce does stick to the chicken wings just creates a vinegar-y, slightly spicy flavor but if you take the remaining sauce and pour it over the chicken wings, then you get an addictively delicious spiciness to the wings ! These wings taste so good you’ll be fighting over them ! The buffalo sauce recipe came from Taste of Home. We weren’t paid in any form to promote Frank’s RedHot or Taste of Home.